Over-ripe frozen bananas and pure maple syrup provide the sweetness in this delicious banana walnut chocolate chunk ice cream recipe, while lightly-glazed, toasted walnuts and chunks of decadent dark chocolate add crunch. A touch of cinnamon adds warm flavor to this frozen dessert. A combination of coconut milk and coconut cream makes this frozen dessert smooth, rich, and creamy. Unlike many other recipes that use coconut milk, the coconut flavor in this non-dairy, vegan ice cream recipe is barely noticeable. Choose dairy-free, sugar-free, and/or gluten-free dark chocolate or cacao nibs or omit the maple syrup or walnuts to suit your dietary restrictions. While it's certainly possible to make ice cream without an ice cream maker, using the freeze- partially-then-beat-with-an-electric-mixer-refreeze-and-repeat method will never produce a frozen dessert with the smooth, creamy consistency of traditional dairy ice cream. This is especially true when making non-dairy ice cream, since the absence of full-fat cream usually produces a more grainy, icy consistency. So if you want your vegan frozen dessert recipes to turn out as smooth and creamy as possible, the key is to use an electric ice cream machine. I developed this recipe during a week-long visit with my husband's parents, using his mother's 1-1/2 quart Cuisinart Ice Cream Maker. My own machine was decades old, had only a 1 quart capacity, took a long time to churn and had been gathering dust in our basement for ages. So I was surprised and pleased to discover how far this type of kitchen appliance had come. The see-through lid with the open ingredient spout on my mother-in-law's model made it very easy to add the candied toasted walnuts and the dark chocolate chunks while the machine was still running. And I was amazed that my test batch was ready to eat a mere 20 minutes after it began churning. The only downside was that the 1-1/2 quart capacity wasn't quite large enough for the recipe. The speed and ease of use of my mother-in-law's machine, the enthusiastic feedback I received from my husband and his parents on this recipe, and the fact that my own decades-old ice cream machine had only a 1-quart capacity prompted me to replace it with a 2-quart automatic ice cream maker (that also makes delicious frozen yogurt, sorbet and gelato). It was a great decision! My husband loves it when I make homemade frozen treats, and we use it year-round. Note: The estimated "cook time" represents the approximate time to churn and freeze the ice cream in a 2-quart Cuisinart ICE-30 Pure Indulgence Ice Cream Maker. The actual time will depend on your machine. At least one day ahead, peel the over-ripe bananas and wrap them tightly in plastic wrap. Place the freezer bowl of the electric ice cream maker and the wrapped bananas in the coldest part of your freezer. Also move the cans of full-fat unsweetened coconut milk and coconut cream to the coldest part your fridge to chill for a minimum of 6 hours. On the day you want to make the ice cream, grease a sheet of baking parchment and a sturdy silicone spatula with coconut oil and set it aside. In a nonstick skillet over medium heat, warm 1 Tbsp. coconut oil until it starts to bubble. Stir in the walnut chunks until they are coated with the oil, then sprinkle on 1/2 tsp. of salt. Continue to heat the nuts, stirring frequently until they are fragrant and golden brown. Drizzle 2 Tbsp. of the maple syrup and use the greased silicone spatula to stir the nuts constantly for a minute or two, taking care not to scorch them, until the nuts are glazed and dry. Immediately spread them out in a single layer on the prepared parchment paper, allow them to cool. Separate any pieces that have stuck together. Remove the frozen bananas from the freezer and unwrap them. Slice each banana lengthwise into quarters and then into one-inch lengths, working as quickly as possible so they don’t defrost. If necessary, pop them (still on the cutting board) back into the freezer for 10 to 15 minutes to firm them up again. Scrape the frozen banana chunks a food processor bowl fitted with a stainless steel chopping blade. Remove the ice-cold cans of full-fat coconut milk and coconut cream from the refrigerator and quickly empty the contents into the food processor bowl. Add the remaining 2 Tbsp. maple syrup, 1/4 teaspoon salt and the ground cinnamon. Process just until the mixture is smooth. 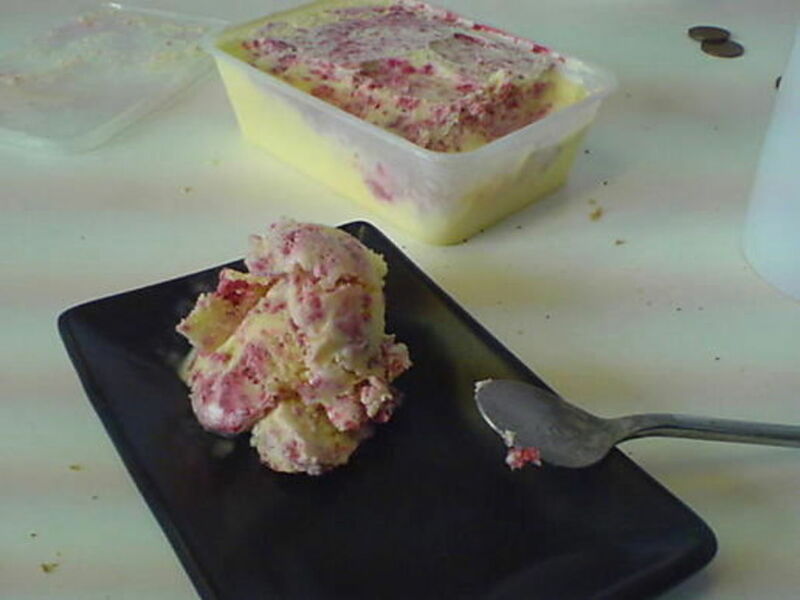 Remove the ice cream maker's freezer bowl from your freezer and place it on the machine's base. Follow the manufacturer's directions for assembling the machine, pour in the ice cold banana-coconut milk mixture, lock the lid in place and turn on the machine. About 5 minutes before the ice cream is ready, add the walnut pieces and chocolate chunks very slowly, following your ice cream maker’s instructions for adding mix-ins. Continue churning the mixture for another five minutes or until it reaches the desired consistency. Turn off and unplug the ice cream maker and use a sturdy silicone spatula to scrape the finished ice cream into a freezer container, working quickly so it doesn’t stick to the freezer bowl. Serve immediately or seal the container lid tightly and freeze until ready to serve. *The nutrition data estimates were calculated by inputting the ingredients (including manually entered nutrition data taken from the manufacturer's label for selected ingredients and the number of servings into the SELFNutritionData recipe analysis tool. I have provided this information as a service to help you make informed decisions about this recipe. 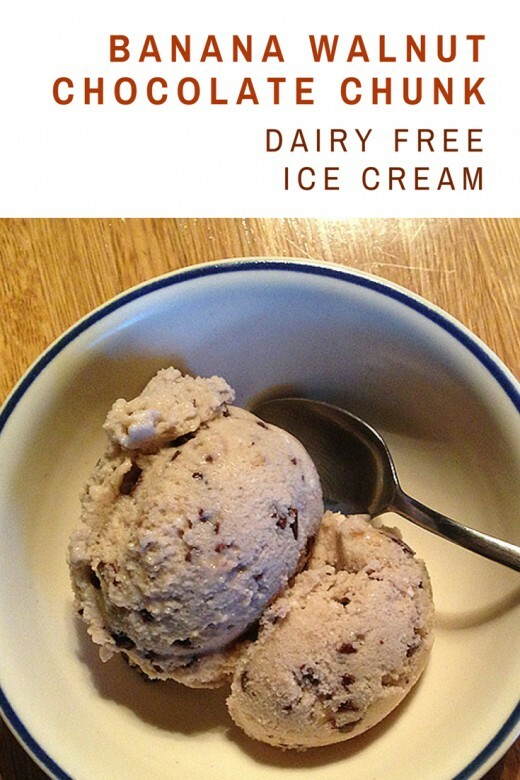 Have You Ever Made Vegan / Non-Dairy Ice Cream? Yes, and it was delicious. Yes, but it was icy / grainy / not creamy enough. No, but I'd like to try. Other (please elaborate in the comments section at the end of this article). The streamlined version of the recipe, above, is short and convenient. I recommend reviewing the following detailed instructions, with close-up photos and lots of helpful tips, before you make the recipe for the first time. Peel 3 large, very ripe bananas, wrap them tightly in plastic wrap and put them next to the freezer bowl in the coldest part of your freezer. Place your ice cream maker's freezer bowl in the coldest part of your freezer (usually a back corner of the bottom freezer shelf) if it isn't there already. Place a 13.5 ounce can of full-fat coconut milk, preferably organic, and a 5.4 ounce can of unsweetened coconut cream, also preferably organic, into the coldest part of your refrigerator to chill. Place a large piece of parchment paper on your counter and grease it lightly with coconut oil. Melt one tablespoon of coconut oil in the bottom of a medium-large, nonstick skillet over medium heat. When the coconut oil starts to bubble, add half a cup of broken walnut pieces and stir to coat. Sprinkle the nuts generously with kosher salt or sea salt and pan toast them until they are golden brown and fragrant. Drizzle the nuts with two tablespoons of pure maple syrup, preferably Grade B or dark Grade A. Using a greased silicone spatula, stir to coat the walnut chunks evenly with the syrup. Continue stirring the nuts constantly until the moisture in the maple syrup has evaporated completely and the glazed nuts look dry, about 1 to 2 minutes. Be sure to keep a close eye on them to avoid scorching. 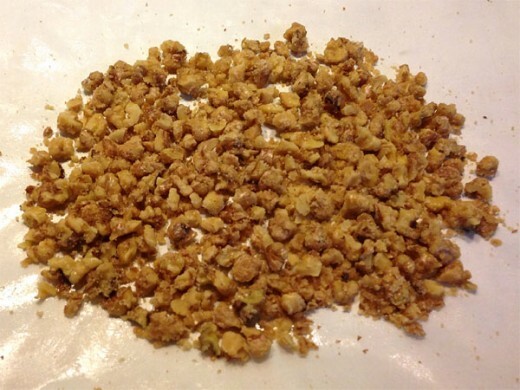 Scrape the walnuts onto the greased parchment paper in a single layer and allow them to cool completely, which should take only a couple of minutes. If any of the chunks stick together just break them apart with your fingers. Leave the nuts on the parchment paper and set it aside. I usually buy walnut halves in bulk and store them in a freezer bag or airtight food storage container in the freezer. The nuts stay fresh for a very long time in the freezer, so I always have some on hand for cooking, baking and healthy snacking. Don't be tempted to chop the walnuts with a knife or food processor. You'll end up with uneven-sized chunks and a pile of wasted walnut "dust". Just use your fingers. Don't even think about using "maple flavored syrup" or "pancake syrup" for this recipe! Choose a good-quality Grade B maple syrup, which provides better nutrition, or a dark Grade A syrup with a robust flavor. I like Coombs Family Farms 100% Pure Organic Maple Syrup, which not only tastes great and is certified organic by Quality Assurance International (QAI), but also is made by seventh-generation, small family farmers using sustainable practices that protect the ancient maple trees and forests. To make a Paleo-friendly version of this recipe, omit the maple glaze. Use a sharp chef's knife to chop about 4 oz. of good quality dark chocolate into small chunks. Choose a brand and type of dark chocolate that is at least 85% cacao for maximum health benefits and read the label carefully to make sure you purchase one that meets your dietary restrictions. Alternatively you can use 1/2 cup of unsweetened organic raw cacao nibs. Dump the dark chocolate chunks or the raw cacao nibs onto the same parchment paper as the nuts and set it aside. 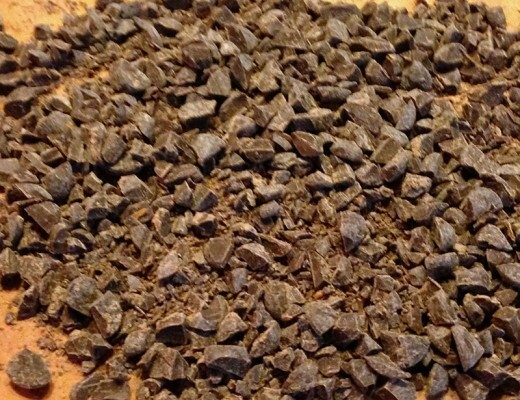 If you wish, you can scrape the chopped chocolate into a mesh sieve and sift out the powdered chocolate "dust". Of course, you wouldn't want to waste all those good dark chocolate bits, so save them to sprinkle on top of the churned ice cream or another dessert. Halve one of the 3 over-ripe, frozen bananas lengthwise and place the halves side by side on a cutting board, flat sides down. Slice each half-banana in half lengthwise again into quarters, then slice them crosswise into thick 1-inch slices. Work quickly so the bananas remain frozen. 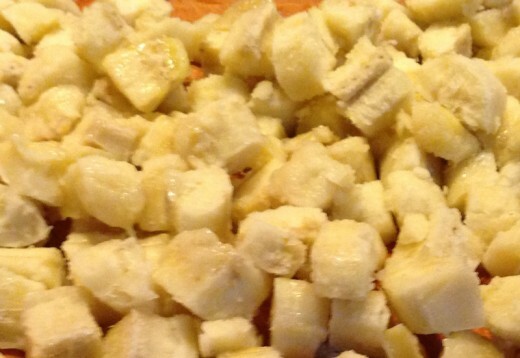 If the banana chunks show signs of thawing after you've cut them, put them back in the freezer for 15 minutes before moving to the next step. Working quickly so that the frozen banana chunks don't have time to thaw, scrape them into the bowl of a food processor fitted with a stainless steel chopping blade. Immediately remove the thoroughly chilled cans of full-fat coconut milk and coconut cream from the refrigerator and pour and scrape the ice-cold contents of the cans into the food processor bowl with the frozen banana chunks. Add 2 Tbsp. pure maple syrup, 1/4 teaspoon kosher salt and 3/4 teaspoon ground cinnamon to the processor bowl and process briefly, just until the mixture is fairly smooth. 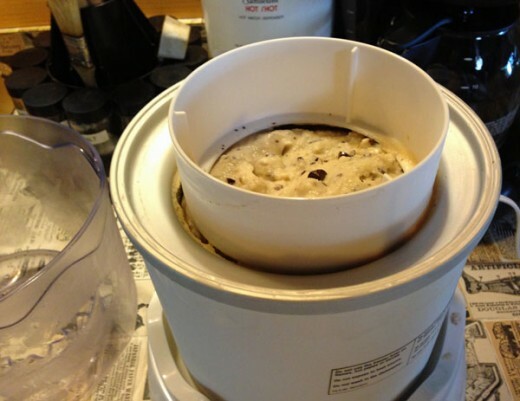 Immediately take the freezer bowl for the ice cream maker out of your freezer, place it on the base of the machine, and scrape the liquid ice cream base from the food processor into the freezer bowl. 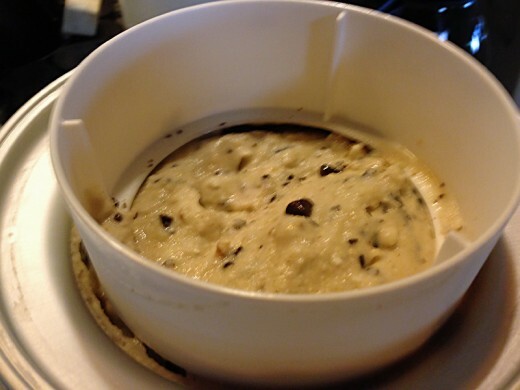 The ice cream maker bowl will start to defrost the moment you remove it from the freezer, so don't take it out until you're ready to start churning the base mixture. And the colder the mixture and the bowl are when you turn on the machine, the faster the ice cream will be ready and the smoother and creamier it will be. If you're using one of the Cuisinart Ice Cream Maker models I mentioned, just lock the cover in place, plug in the machine and turn it on. If you're using another brand or model of ice cream maker, follow the manufacturer's instructions for starting the churning cycle. After about 15-20 minutes the ice cream base will be the consistency of soft-serve ice cream. (You'll be able to tell just by looking into the ingredient spout's large opening.) At this point, with the machine still running, carefully lift up the parchment paper with the walnuts and chocolate chunks or raw cacao nibs. Angle the paper slightly over the ingredient spout opening, bring the edges together a bit so the paper acts like a wide funnel, and very slowly pour the walnut and chocolate mix-ins into the opening. Allow the ice cream to continue to churn for approximately 5 minutes longer until it reaches ready-to-eat consistency. Follow the manufacturer's instructions for adding mix-ins. This is what this dairy-free ice cream looked like immediately after I turned off the machine and removed the cover of the ice cream maker. As soon as the ice cream reaches the proper consistency, stop the machine and unplug it. With a sturdy silicone spatula, immediately scrape the ice cream out of the freezer bowl to prevent it from sticking and pack it lightly into a freezer container with a tight-fitting lid. Important: Don't use a metal spoon, spatula or other utensil that could damage your ice cream maker's freezer bowl! Serve some of the ice cream immediately, if desired, then seal the container and store it in the coldest part of the freezer until ready to serve. For a harder consistency, freeze or an hour or more in the coldest part of your freezer before serving. Drizzle each portion of ice cream with a teaspoon of pure maple syrup. Top each portion with whipped cream (for non-vegans) or with a vegan whipped topping such as sweetened or unsweetened whipped coconut cream or whipped cashew cream. Sprinkle each portion with additional maple-glazed walnuts. Have You Ever Made Ice Cream? What About Vegan, Dairy Free, Gluten Free, Caveman Diet or Paleo Friendly Ice Cream? oooooh, this is fantastic! I have recently started testing different vegan recipes because my daughter and her husband are both vegan. I strive to have something they can enjoy for family dinners. This ice cream recipe would be a truly awesome treat for them (and all of us). I will definitely have to make some soon. Thank you for the excellent tutorial and recipe. Hi Lorelei! 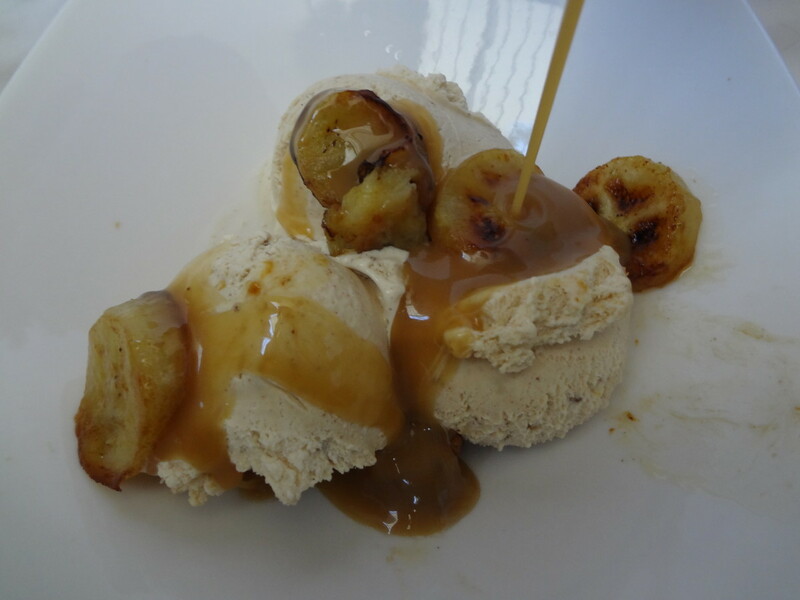 I think you'll find that this kicks all those other banana ice cream recipes up a notch. Another great variation is to stir just enough boiling water into a couple of spoonfuls of instant coffee or espresso to dissolve the granules, let the liquid cool, and stir it into the coconut milk and banana mixture before churning. Yum! 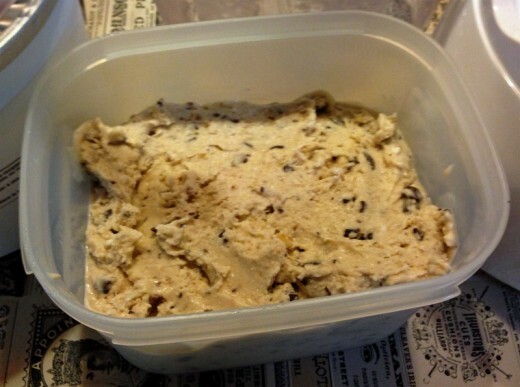 This ice cream recipe looks and sounds so delicious, Margaret! Banana and coconut plus chocolate, hard to imagine anything but good things here! Pinning and Yumming the recipe for future reference. Thanks for sharing! @favored Hi Fay, thanks so much for sharing this recipe! I love the crunch and flavor of the chopped maple-glazed walnuts in this ice cream, but I'm sure it would be great even without them. Given that you enjoy walnuts with a banana as a snack, though, you might want to give it a try with the nuts! Glad I came across this recipe. It looks like I'd really like it, not sure about the walnuts though. I love them, but not usually in ice cream. Funny since I eat walnuts with a banana for a snack! LOL Pinned & shared! @Charito1962 Hi Charito! Oh, I really envy you living in the Philippines where coconuts are so plentiful! I love them, and there's nothing quite like fresh ones. I'm delighted that you like my banana walnut chocolate chunk ice cream recipe with coconut milk and hope you get a chance to try it! Wow, this ice cream sure looks yummy, Margaret! (You tempt my sweet tooth!) Funny, but it looks like a soft chocolate chip cookie. I come from a country where coconuts are abundant, so ice cream with coconut milk sounds sinfully delicious! Thanks, Larry! I hope you get to try this recipe. Sounds delicious. I have not tried making ice cream out of coconut milk yet. I wish I had seen this hub just a few weeks earlier. There was an ice cream maker at a garage sale and I thought I'd never use it since I can't have milk. Maybe I'll find another one. I don't want to pay full price since I would only be using it for me. 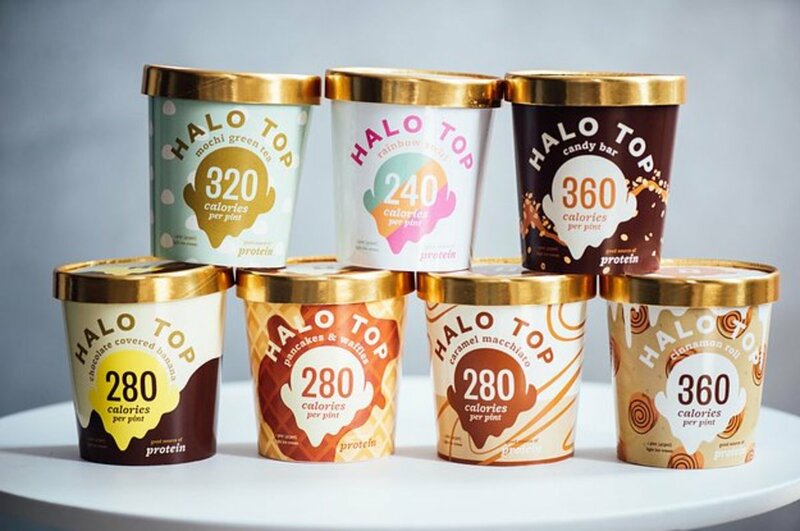 @techygran, the good thing is that although this ice cream tastes delicious it's much healthier than store bought ice cream, ice milk or light ice cream so you can give in to your cravings if you want to without a guilty conscience. 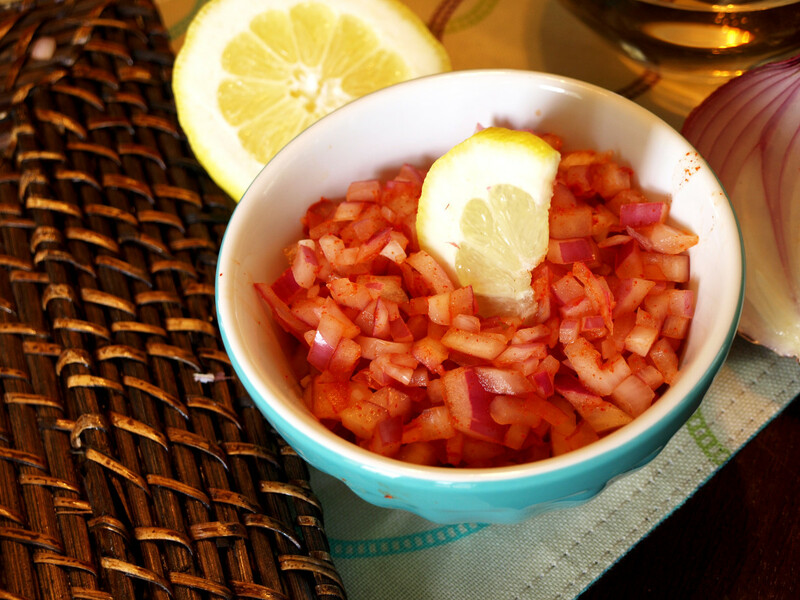 If and when you do decide to try this recipe I'd love to know how you like it! This looks really wonderful, and I must say that I am salivating, but it is late at night and I won't give in! I will be back, though! Thank you. Just checkin in to see if you are okay. I hope you are. And I hope that you are in the process of writing another great hub with another tasty recipe. Thanks so much for thinking of me and taking the time to write such a lovely note. You are a dear man. 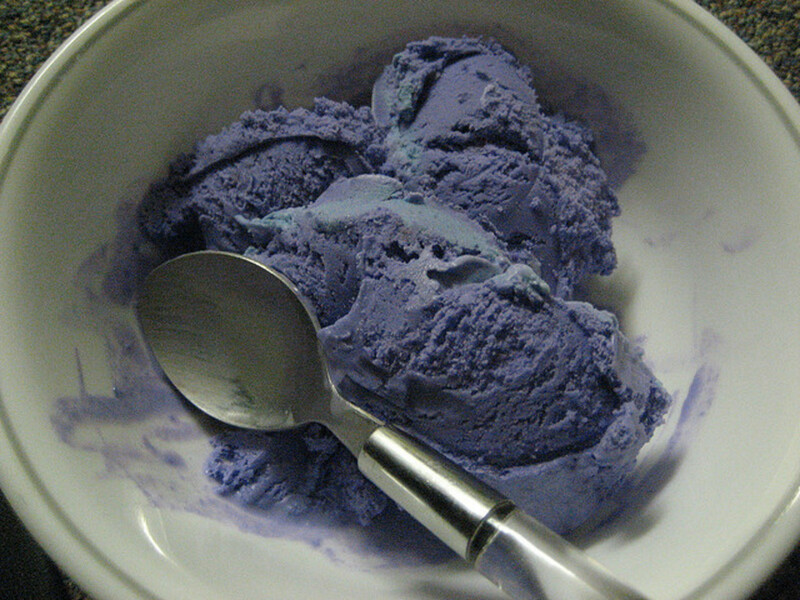 I hope you get a chance to try this ice cream recipe some time! I hope that YOU are happy and well. I am sitting here in my living room with my coffee taking a break from another project I do each week: recording news items on my desktop and email them to a good friend at a nearby radio station. You are not just my follower, but a good friend. Sandy, I think you'd love it! 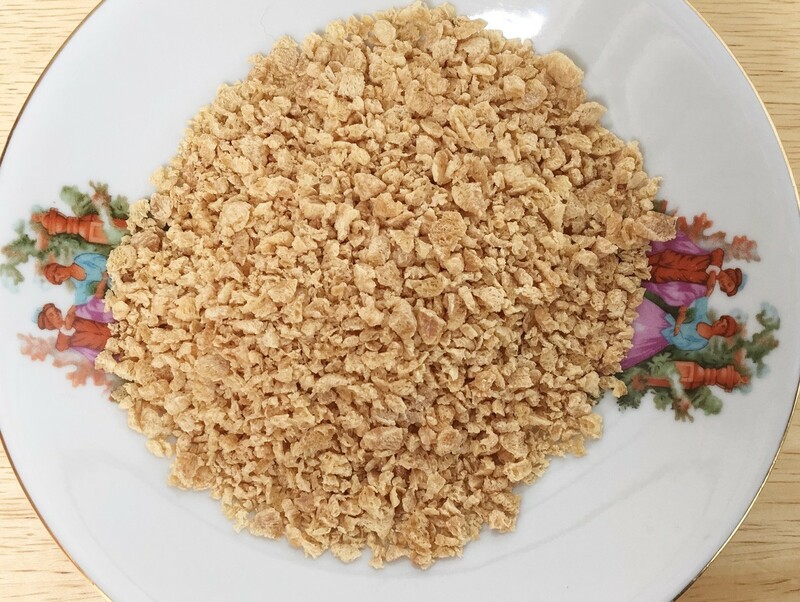 It's an unusual and delicious flavor combination and really easy to make. In fact, I'm making some later today! I still have a Cuisinart Ice Cream Maker from a few Christmas times ago that hasn't been used. This recipe sounds good for it. Just wanted to say hi and hope that you are having a safe and peaceful night. You are a true hubber in every respect. Stay sharp, but most of all, stay shane. And stay in touch. Hi Kenneth! Sorry for the late reply - I was traveling and without WiFi access. I'm fine, thanks, still working on "hubbifying" my lenses. I hope you're well and happy, my friend! How are you? I just wanted to say hello and make sure that you were okay and still turning-out these fine hubs. I wish you a happy and safe night and peaceful weekend. Cynthia, I'm so glad you like this vegan ice cream recipe. If my own experience with my husband and my in-laws is any indication, your whole family, vegans and non-vegans alike, will gobble it up. :) Please let me know how your daughter likes it. How wonderful! My daughter is a vegan and I have the worst time trying to find good vegan recipes. I will definitely have to try your ice cream recipe. @Kenneth, thank you for your wonderful comment. I'm truly delighted that you enjoy my articles! I'm still working my way through my transferred Squidoo lenses to "hubbify" them appropriately, but I definitely am looking forward to coming up for air long enough to write new articles again. Thanks again for your very kind support and encouragement. To me, and totally-frank, YOU are a shining light on Hubs. Your work is refreshing and your work is both interesting and fun to read. Plus being helpful and you share so much information. I urge you to keep it up. Thanks for our chat on this hub. I take this moment to wish YOU a happy, safe, and peaceful week ahead. I flew by here again just to tell you how MUCH I admire your writing also. You humble me with how easy you put it together on your hubs. "As long as God gives me breath, I will always be your friend." Your extremely kind comment just made my day - maybe my week! I admire your writing talent very much and your compliment and encouragement are deeply appreciated. Please know that your friendship is valued and reciprocated. I am humbled by your remarks. I DO love your work and I urge you to continue to write no matter if you feel like it or not. You have such a wonderful talent. I do not want you to waste or hide it. Kenneth, Your Friend for Life. Yummy! I'm glad you linked to the cacao nibs. I forgot that I needed to buy more. Thanks, Bill! Unfortunately I don't have access to dry ice, so for the moment you're on your own. ;) Thanks for accepting my request to connect on FB! I can't tell you how grateful I am for your extraordinarily kind and enthusiastic feedback on this recipe hub. As a former Squidoo lensmaster who is new to HubPages, it means the world to me to receive such glowing praise from a writer whose work I admire. Thanks for your wonderful support and encouragement! 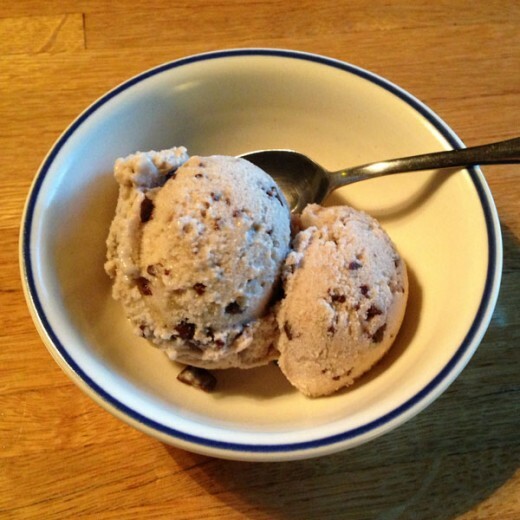 Thanks very much for your wonderful feedback and for sharing my Banana Walnut Chocolate Chunk Ice Cream recipe with your Pinterest and HubPages followers! Greatly appreciated. Thanks very much, @DealForALiving! So glad you enjoyed this recipe. Looks delicious and wonderful to behold on a hot day (95+degrees F.) in Texas! Pinned this to my 'Fabulous Desserts' board and will share with followers on HP. This looks absolutely amazing. I love ice cream recipes. I literally LOVE this hub! Yum! I love hubs that talk of ice cream, which happens to be my ONLY weakness. I am weak now with hunger. @clouda9 lm: Yes, I'd say your uncle was a wise man, too! :) I'm really glad you enjoyed the recipe and hope you get a chance to try it. I maybe altering this a little bit to remove the walnuts and the coconut milk. Hope you don't mind. But I don't like either. The wife on the other hand may object to my alterations. My Uncle used to set up the hand-crank ice cream machine and give each one of us kids a turn to spin it a bit. Wise man I'd say :) This ice cream not only sounds good, it looks mighty good too. Thanks for sharing the recipe. @tracy-arizmendi: Oh, Tracy, you're going to absolutely LOVE this recipe, I promise! My in-laws eat regular dairy ice cream for dessert most evenings and they could barely believe that this yummy flavor was healthy, vegan and non-dairy. 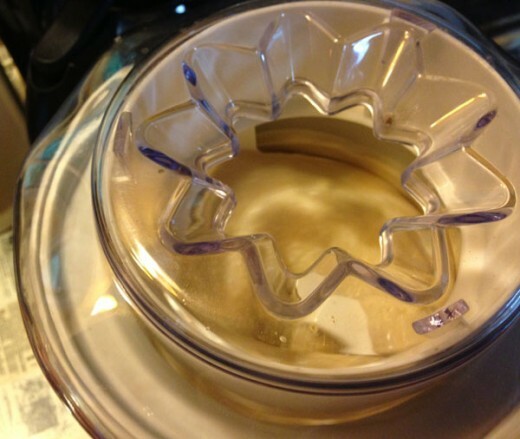 You'll love the Cuisinart ice cream makers I recommended, too! I'm definitely upgrading from my decades-old model soon. Ok..I my next new appliance is an ice cream maker!!! I avoid dairy so being able to make my own ice cream would be super!!! @Brite-Ideas: Thanks so much, Barbara! I'm truly grateful for your enthusiasm and support. Once, many years ago. It's so much easier to make ice cream with these cool appliances. Your recipe sounds outstanding! a FANTASTIC page and recipe Margaret! you know where this is headed, to my food board on Pinterest! Thanks to you you, my food board is looking awesome! @David Stone1: Thanks very much, Dave. This ice cream is that wonderful and all too rare thing, a luscious indulgence that's also good for you. I hope you get a chance to enjoy it! I have not, but if I ever decide to, this is going to be the one. What a great dish! Thanks for the inspiration, Margaret. I'm making ice cream tonight. This sounds wonderful!